I've just posted isometric dungeon tutorial #8: how to convert a 2D map into a 3D isometric map. 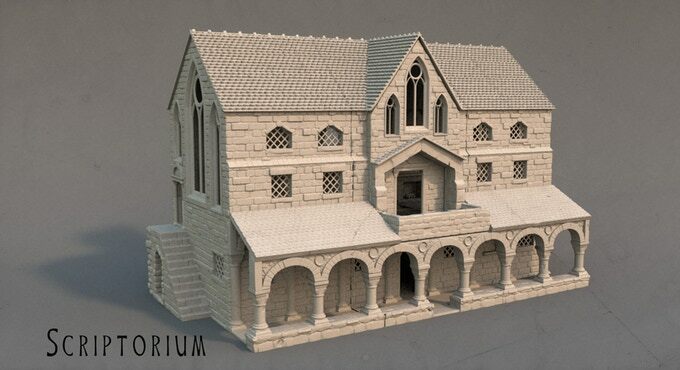 Soon there will be a Trilemma Adventure for which you can get actual 3D printed terrain. Read on! I'm walking the halls of Breakout Con when I stumble across a vendor table where a 3D printer is busily at work. Mmmmmmmmmrt. Mmmmmrrrrrt. 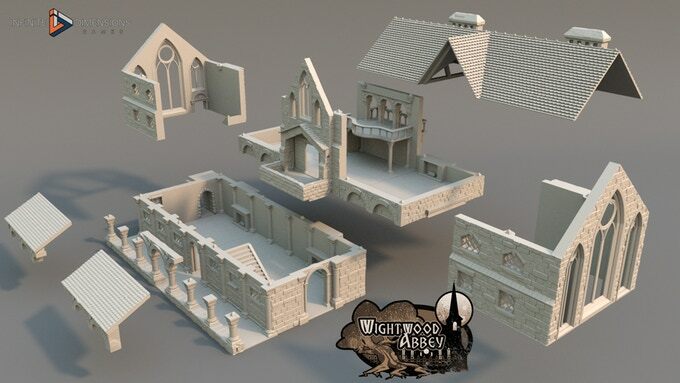 It's printing the most jaw-dropping piece of medieval architecture, the Wightwood Abbey Scriptorium. My pen hand starts twitching.. I have to draw this place! Imagine my surprise when it turns out the guy behind the table is James Binnie, local swell guy and my Night Witches GM from the con the previous year. James and his partner Dawa have teamed up as 'Infinite Dimensions', and they're making right at the tail end of a kickstarter to make print-yourself 3D miniature terrain. Look at this thing. Look at it! 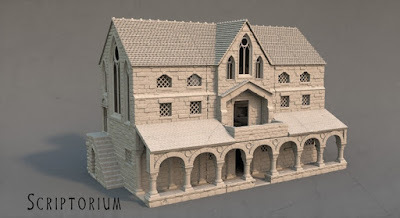 It's not just a scriptorium, it's a whole set of buildings - scriptorium, church, stables, gate house, the abbot's house, and walls to go around the whole thing. 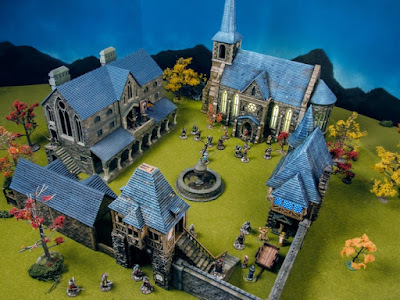 It all comes apart, it's built for miniatures play, and it's gorgeous. Anyways, long story short—James and I were apparently having exactly the same idea. So: I'm going to set a two-page adventure here. Dawa (the model whiz) is going to get me some higher-res reference shots to work from, and it's going to be so much fun. Wightwood Abbey is already a storied place in James and Dawa's gaming, and I'm going to be tapping into that when I write the adventure. But, that's all in the future. Now, there's only one thing to worry about: the Kickstarter is nearly over! Go there now, before it's too late! The monstrous god-avatar of a drowned nation presides over the unholy alliance between the living and the dead. It leaves prosperity in its wake, but its demand for sacrifices is insatiable. 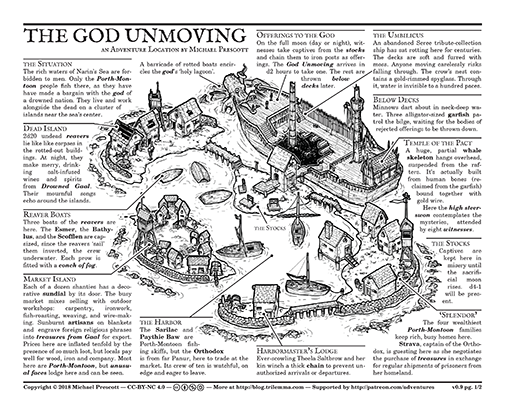 Adventure #42 is The God Unmoving. I thought I'd try something different this time and do an overview video, explaining how I imagined GMs might use this adventure in their sandbox worlds, but I also present some one-shot hooks. 1. Rumor has it that the Panurians are treating with the Porth-Montoon. What could come of this strange alliance? 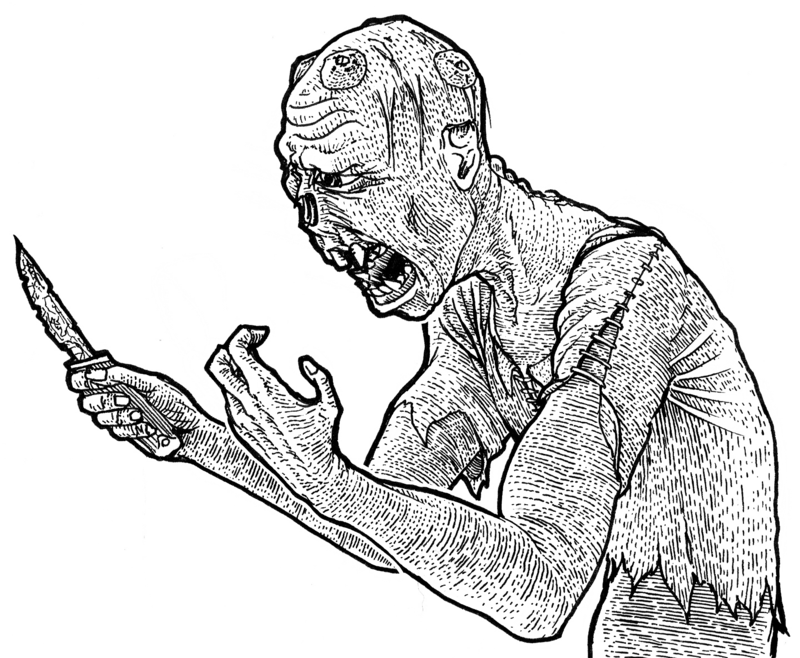 Infiltrate the Porth-Montoon and find out what the Panurians are up to. 2. Rumor has it that the usurped former King of Panur is hiding out in Narin's Ring. Find him, and bring him back—or maybe just his head! 3. How is that a simple fishing people are awash in gold? What have they discovered? This could either be a fact-finding mission, or an invitation to straight-up murder-hoboing. 4. Safe passage across Narin's Sea would be a tremendous boon. Go to this so-called "High Steerswon" of the Porth-Montoon, get an audience, and find out what they want to spare our ships from piracy. 5. Alas, the Lord of Somewhereton has been taken at sea by pirates. 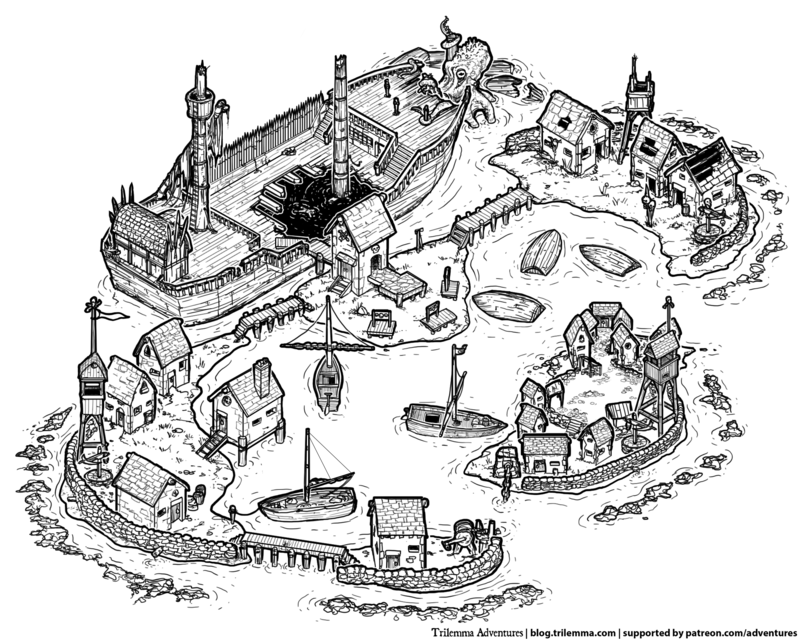 The fleeing vessel was last seen heading toward the center of Narin's Ring, where it's known the pirates congregate. Get in, get the Lord, and get back out. If pirates get hurt in the process, so much the better. 6. The pirates of Narin's Ring have become too bold. Take your party and strike a blow that will make them think twice about bothering our honest, peaceful people. As always, the art and text is released under CC-BY-NC 4.0. Thanks Patrons! Luka Rejec had the fantastic idea of offering up a illustration-as-prize for this year's one page dungeon contest, and I'm joining him. ..except it'll be the dungeon you came up with. You'll be free to do whatever you want with these. Release a revised version of your 1PDC if you feel like it, include them in your 6-page deluxe expanded edition, put it on a t-shirt, tape it to your ceiling so it's the first thing you see when you wake up, it's up to you. The only thing you need to do is submit an entry. * Seriously, not one second later than midnight, UTC. Any later and all you are is crazy early for the 2019 contest. 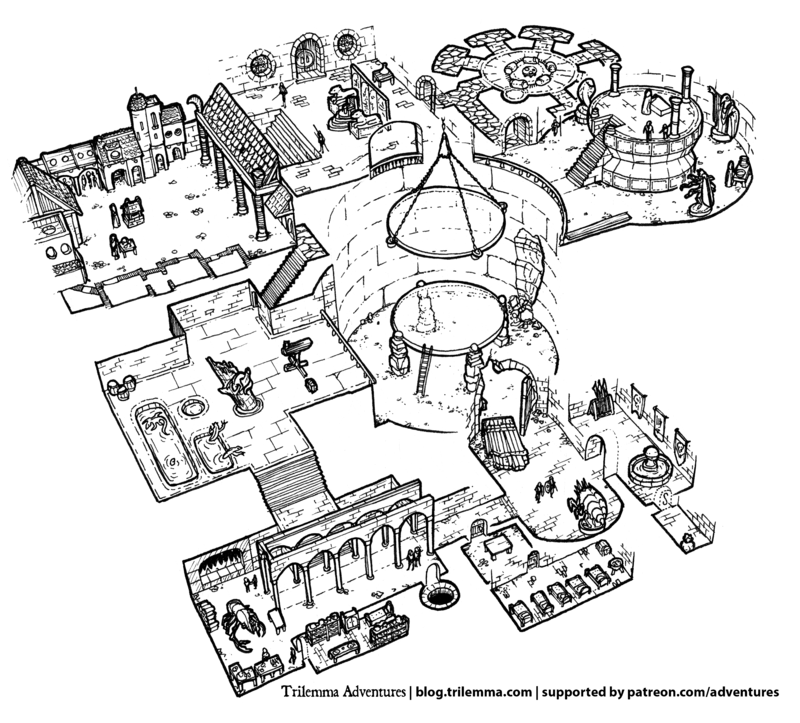 I've put together a tutorial for one of the more brain-boggling aspects of isometric dungeon drawing, circular stairs. If you're just watching it to see that it can be done, enjoy—but if you're watching to actually do this and draw some, definitely watch the (less exciting) video on how to draw isometric circles. Circular stairs are (no surprise!) riddled with circles and bits of circles.